DUNCAN, SC - Each year PLASTEC West draws thousands of plastics professionals in search of the most innovative solutions in the industry. 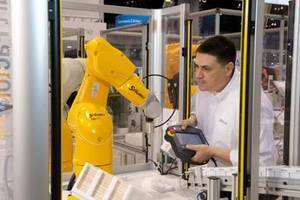 When the show returns February 14 - 16 at the Anaheim Convention Center in Anaheim, CA, Stäubli's Connectors and Robotics Divisions will jointly present their solutions for automation in the plastics industry at Booth 3811. Take advantage of this unique opportunity to find out about ground-breaking developments, including the unveiling of the TP80 Fast Picker, representing "the future of high-speed kinematics." 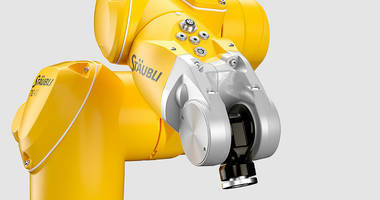 The industry leader in technologically advanced robotics and connector systems, Stäubli will also showcase several other unique automation solutions aimed at delivering the highest possible throughput and shortest cycle times. The TP80 is expected to set new benchmarks for pick and place applications. A four-axis robot, it is designed to deliver higher speeds of more than 200 picks per minute, as well as more flexibility. It is also more agile and lightweight than most robots on the market, maintaining high precision with homogenous repeatability throughout the entire work envelope along with extremely fast cycle times. A simple base or wall mounting eliminates the need for a large, costly gantry, enhancing the robot's cost-effectiveness and ease of integration. In addition to the TP80 Fast Picker, highlights will include the TX60 Stericlean, an ultra-precise, six-axis industrial robot, and the TS60 conveyor tracking system for dual picking and placing of parts. Also on display at PLASTEC West will be Stäubli's quick mold change system, designed to improve productivity at every step of your process. See the possibilities with applying the Stäubli equipment for mold loading, mold clamping and energy connection. Staubli provides single or multi-couplings solutions best suited to your requirements. PLASTEC West offers the opportunity to explore firsthand the latest plastics industry developments, featuring increased efficiency and productivity in technologies, products and services including primary processing machinery, computer-aided design and manufacturing, production machinery, materials, molds, automation technology, materials handling and logistics and much more. Visit www.canontradeshows.com/expo/plastw12/ for details. Stäubli is a mechatronics solutions provider with three dedicated divisions: Textile Machinery, Connectors and Robotics. With a workforce of 4000, Stäubli has a presence in 25 countries and agents in 50 countries around the world. For more information, visit www.staubli.com.